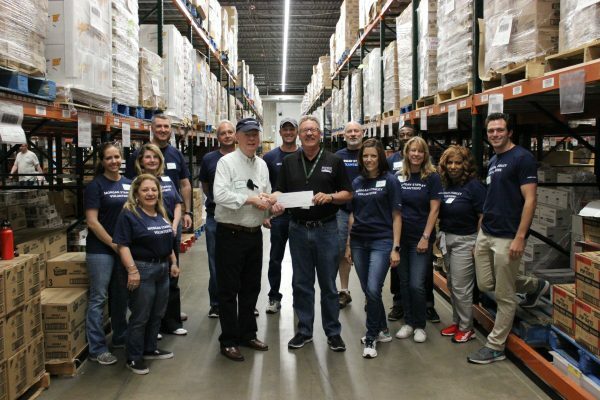 Morgan Stanley Complex Manager Clarke Octigan (left) presents a check to Kevin Seggelke, President & CEO of Food Bank of the Rockies (right) at the Food Bank of the Rockies warehouses in Denver. DENVER, Colo. – The Food Bank of the Rockies on Monday announced a new grant from the Morgan Stanley Foundation to support the food bank’s fresh produce program. The funds will be used to increase the food bank’s ability to access, transport and store fresh produce and provide fruits and vegetables for local residents. “We are proud to continue our commitment of providing fresh produce to children and their families. This grant will make healthy foods available to those who might otherwise not have access to them,” said Morgan Stanley Complex Manager Clarke Octigan. Seggelke adds that with the Food Bank’s ability to purchase produce at 10 cents per pound, Morgan Stanley’s donation will provide 100,000 pounds of fresh produce. Food insecurity continues to be an issue facing millions of Americans. According to data from the United States Department of Agriculture (USDA) released in September 2016, 42 million people in the United States are living in food-insecure households, 13 million of whom are children. Feeding America’s Hunger in America 2014 study found that 89 percent of Feeding America’s client households with at least one child lack reliable access to a sufficient quantity of affordable, nutritious food.